Part 2 of 5. Read the previous part… by Paul Hartal. The mysterious irrationality of the nullity: zero equaling plenty– arising from the bewildering mathematical complex of the concise and elegantly wrapped Euler Identity—had cast a particular spell on Benjamin Peirce, who in 1831, at the age of 22, had been appointed Professor of Mathematics at Harvard. During a lecture on the Euler Identity that Professor Peirce delivered to his students he exclaimed: “Gentlemen, that is surely true, it is absolutely paradoxical, we cannot understand it, and we don’t know what it means, but we have proved it, and therefore, we know it must be the truth” (7). Peirce continued to teach mathematics at Harvard for half century, until his death in 1880. The lunar crater Peirce is named in his honor. On a September day in 1997, the American warship USS Yorktown was maneuvering off the cost of Virginia when suddenly its propulsion system failed. All the machines of the warship stopped to function and the Yorktown was incapacitated in the Atlantic Ocean for 2 hours and 45 minutes. The propulsion system failure was caused by a seemingly trivial blunder when the software program made an error by dividing with zero, which in turn resulted in the shutting down of the ship’s propulsion machinery. “Zero hit the USS Yorktown like a torpedo”. The zero remained hidden in the software code and when it reached the system memory the computer made a futile attempt to divide by it, which throttled the engines and brought 80,000 horsepower to an instant halt. It took two days for the engineers and system analysts to find the reason for the problem, to remove the zero from the software and repair the engines (8). This incident shows that a tiny symbol of nothing –the zero can render a modern warship dysfunctional. The billion-dollar guided missile cruiser USS Yorktown was dead in the water for almost three hours. Its armor was built to repel enemy attacks but it turned to be defenseless against the strike of the zero symbol. All this happened because of a computer programming error. According to a Scientific American article, the US Navy outfitted the Yorktown with “Smart Ship” computer technology in order to reduce crew levels and prepare the fleet for the 21st century. However, just a few years prior to the start of the new century, while sailing in the early autumn ocean, the cruiser suffered an engine failure “after a crew member mistakenly entered a zero into the data field of an application”. What happened next was that “the computer system proceeded to divide another quantity by that zero. The operation caused a buffer overflow, in which data leaked from a temporary storage space in memory, and the error eventually brought down the ship’s propulsion system” (9). The problem of division by zero unearths the shaky theoretical foundations of mathematics. For, despite the popular myth that mathematics operates with utmost precision and consistency, its constructs are built on tottery columns. Take, for example, the arithmetic operations of multiplication and division. All numbers that can be multiplied also can be divided. However, this is not a universal mathematical law, because zero is a number but the rules of arithmetic are inconsistent in its regard: While we are allowed to multiply by zero, dividing by it is an arithmetic no-no and we are forbidden to do such a monstrous thing. It is noteworthy that the ancient mathematicians permitted division by zero. In India Brahmagupta in the 7th century and Mahavira in the 9th century allowed the practice. It was only much later that mathematicians established the rule prohibiting division by zero. The justification for the existence of this mathematical inconsistency derives from the algebraic experience wherein dividing by zero can yield absurd results. However, division by zero is not the only procedure that can yield wrong results. Other algebraic operations involving the number of zero can lead to nonsensical conclusions, too. This arithmetic absurdity is not the outcome of trickery, a rabbit pulled out from the magician’s hat. It arises in perfect concord with the established rules of mathematics. The “solution” results from a correct algorithmic procedure. 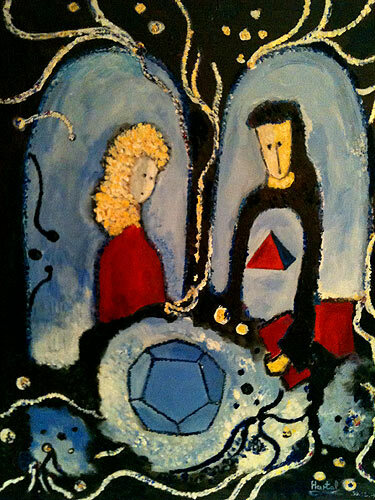 Figure 3: ‘Dodecahedron’, Acrylic on canvas, 60 cm x 45 cm, 1992. Geometry serves as a poetic symbol that opens the magic gate of the ineffable experience of love enveloped in the ethereal mystery of existence. In the course of his mathematical calculations even the scientific genius of Albert Einstein once absent mindedly overlooked a division that involved zero values on both sides of an equation. Among the four highly original papers that Einstein published in 1905, The Special Theory of Relativity is the most extraordinary. The theory made all energy equivalent to mass, E = mc², it proposed that a body moving at the speed of light would have zero length and infinite mass, while time combined with the three spatial dimensions of space formed a fourth dimension and would come to a standstill. Einstein’s error of dividing by zero happened in 1915 when Einstein introduced the “Cosmological Constant” into the field equations of his General Theory of Relativity. He viewed the universe as stable and unchangeable in time, and he needed the cosmological constant to eliminate from the equations the implications that the universe was not in a steady state. The Cosmological Constant was a repulsive force, which unlike ordinary gravitational attraction, increases as the distance grows between objects. In 1917 Einstein told a friend that cosmological considerations arising from the General Theory of Relativity showed that the universe was a closed continuum and it had a roughly spherical space. His calculations indicated that the universe had a diameter of about 100 million light years, which in round numbers is a distance of approximately 700 trillion miles. It was the mathematician Alexander Friedmann (1888-1925) who in 1922 noticed Einstein’s error of dividing by zero. However, Friedmann also discovered that the equations of the General Theory of Relativity suggested an expanding universe. Friedmann’s findings irked Einstein for some time and only in 1923 he acknowledged his mistake. Six years later Edwin Hubble (1889-1953) provided astronomical evidence that galaxies outside the Milky Way were receding and the universe was indeed expanding. By 1930 Einstein discarded the Cosmological Constant and with it the idea that the cosmos was stable and unchangeable in time. Years later, in a conversation with Friedmann’s former student, the physicist George Gamow, Einstein remarked that the introduction of the Cosmological Constant was the greatest scientific blunder of his life. Nevertheless, as Max Born pointed out, Einstein’s vision of the universe as a finite but unbounded space represents one of the greatest ideas in the history of science. “It solved the mysterious fact why the system of stars did not disperse and thin out, which it would do if space were infinite”; and It also “opened the way to the modern concept of the expanding universe” (10). © Paul Hartal, Montreal, Canada. Quote: “However, division by zero is not the only procedure that can yield wrong results. Other algebraic operations involving the number of zero can lead to nonsensical conclusions, too. My comment on the quote: Other algebraic operations? You realize canceling is done by dividing? There is no such arithmetic operation as “canceling.” In order to cancel those zeros you must divide both sides by zero. Which as you previously established is NOT permissible. Your arithmetic demonstrating 3=7 was an illegal operation. – Re: “There is no such arithmetic operation as canceling”. – Is that so? The Oxford English Dictionary says that in Mathematics the verb cancel denotes “strike out (same factor) from numerator and denominator, from two sides of equation, etc.” And according to Webster’s New World Dictionary of Mathematics, cancellation means “the removal of a term or factor common to both sides of an equation. “ Also, Mathematics Encyclopedia (Max S. Shapiro, Editor, New York, Doubleday, 1973) does not reduce cancellation to the domain of multiplication but declares that “two numbers are said to cancel if their sum is zero. Thus, +3 + (-3) = 0, and the 3 is said to have been ‘cancelled’” (p. 23). The statement that Zero is a strange number remains valid. The rules applying to zero are inconsistent. We can multiply by it but we are forbidden to divide by it. It is essential for calculation and at the same time it is excluded from counting. You can see this paradox, for example, in our calendar: Thus the 1800s are years of the 19th century, because there was no “zero-th” century when the calendar started. Besides acting as counters, zeros also function as filler digits. Take, for example, the last glacial period, which according to scientific estimates ended about 10,000 years ago. The four zeros here are filler digits. Mixing zeros as filler digits with zeros as counters will give silly results. Therefore it would be ridiculous to say: The information about the Ice Age comes from a book printed 12 years ago, so the last glacial period actually ended 10,012 years ago. Our concept of the zero grew out of philosophical speculations on The Void in Hindu civilization. Mathematicians for long time permitted division by zero. Now lots of educated people impose a straitjacket of a rational blueprint on the universe and many math teachers try to shield their students from discovering the paradoxes and mysteries inherent in nature and mathematics, of which zero is a salient example.